This tradition dates back to the 1820 when a young priest named Francisco Vigil de Quiñones noticed that in the chilly mornings of the last days of the year, his congregations were dwindling. People seemed to prefer to spend time in their warm beds than fill the pews of his church. To persuade them to change their ways, he came up with an ingenuous solution. He got together a group of children and encouraged them to make as much noise as they could. They were instructed to gather horns, tins full of pebbles, maracas, pots and pans, and do whatever was necessary to ensure that everyone would be up for the series of masses beginning on the 16th and ending on the 24th of December. The plan worked. The church soon filled up, and one of the most popular festivities celebrated in Cuba, the Parrandas de Remedios, was set off. By 1835, the tradition had become such a success that a decree was issued by the government forbidding the noisy parade before 4am. A few years later, the cacophony had evolved into an orchestra, with singers, guitars, mandolins, harps, congas, claves and an instrument that was used exclusively in parrandas, the atambora—a small barrel-shaped drum covered with a tanned goat hide. More changes followed over the following 150 years, leading to the present-day assortment of music, art, and firework. The dramatic finale on Christmas Eve is now a wild battle of firework displays, lights and artwork between two huge floats, each representing one half of the town. The parranderos make a tour of the neighborhoods of Remedios, dancing to the sound of polkas and rumbas composed more than a century ago. The competitive character that survives in today’s celebrations goes back to the mid-19th century. The eight neighborhoods into which the town was then divided organized themselves into two rival groups, El Carmen and San Salvador, each with its own musical clan. Today the main event on the December 24 still begins with a “rival rumba” between the two clans. This celebration has now extended to nearby cities including Camajuaní, Vueltas, Caibarién, Guayos and Encrucijada, as well as to other towns in central Cuba. But nowhere yet rivals Remedios. Year after year, its inhabitants spend several months making the elaborate floats, homemade rockets, costumes and all the other paraphernalia connected with the festival. All is done in the strictest secrecy to be revealed only on the opening night of the parrandas. At 10pm on December 24, the church bells begin to ring announcing the start of festivities. The night sky glows with fireworks for several hours. Stunning art works on the plaza are lit, and the floats—the result of many hundreds of hours of labor by carpenters, electricians, designers, dressmakers and whole teams of local workers—begin their triumphal parade. The Carmelitas from the Carmen neighborhood, and the Sansaríes from the San Salvador neighborhood, travel down Remedios’ old streets. In this competition, devoid of judges and juries, everyone’s a winner. 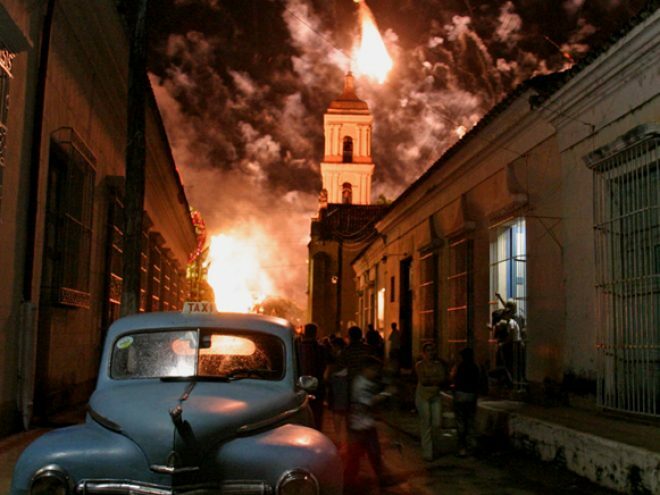 At dawn, around the same time those sleepy locals were roused from their sleep two centuries ago, Remedios’ visitors, many wearing hats as a protection against the fireworks, head to their beds. Meanwhile, the residents of El Carmen and San Salvador begin secretly planning next year’s Parrandas.